David LeRoi isn’t hiding anymore. The 55-year-old Vietnam vet, by his account, spent much of the last 15 years living everywhere from camouflaged huts in the woods in Franklin Park to crevices hollowed out along the Mass. Turnpike tunnels. Now, despite cold and snowstorms, the self-described father of four has traded his invisibility for a perch so flagrant he might as well have camped out on City Hall Plaza. Nearly every day for the past few months, except when briefly rousted by police a few weeks ago, LeRoi has pitched his bright blue tent smack in the open on the Esplanade — just a few feet from the thousands of commuters who pass on Storrow Drive, beside one of the park’s main jogging paths, and well in view of the multimillion-dollar townhouses across the parkway. The former electrician’s campsite has become a one-man test of the Department of Conservation and Recreation’s new policy of taking a more aggressive approach with the homeless, made visible in September when the state forced some three dozen people from elaborate shanties they built under the Mass. Ave. Bridge and Park Drive. Last month, after repeatedly asking him to move, State Police arrested LeRoi for trespassing. But when he appeared in Boston Municipal Court, and the judge learned LeRoi hadn’t been accused of harassing anyone, drinking, or vandalizing, he dismissed the charges. ‘‘I usually deal with murderers, rapists, etc., but here’s a person who’s relatively clean, well-spoken, not causing trouble, and with no criminal history,’’ said Judge Michael F. Flaherty, who cleared LeRoi. ‘‘His behavior was not in question, and he found a place where he feels safe. Is there an appropriate punishment? Jail? A fine? I don’t think so. I told him to relocate, to the other side of the river, to Cambridge,’’ which isn’t state property. Instead, LeRoi returned to his spot on the banks of the frozen lagoon, this time reinforcing his tarps with rope, cardboard, and an array of duct-taped wood, metal, and large umbrellas. To endure temperatures that have dropped as low as 10 degrees in recent weeks, the lean man with a gap-toothed grin has hoarded warm clothes from local charities, including a puffy winter jacket, Thinsulate gloves, thermal underwear, and three pairs of socks he wears beneath heavy boots. At night, he zips himself in two sleeping bags set off the ice-covered ground on a park bench, which his tent surrounds. He uses extra blankets to keep several bottles of water warm enough so they don’t freeze. To avoid attracting wildlife — he once found a rat lounging on a knapsack inside his tent — he seals all his trash in plastic bags and hangs them from the spokes of an opened umbrella that props up his roof. Of course, sleeping outside — as some 300 of the city’s roughly 6,000 homeless people do every winter — can be risky. Aside from the cold, there’s the crime. Last year, 53 homeless people died on the streets, nine more than in 2004, according to Boston Health Care for the Homeless Program. At least four of those deaths are suspected homicides. The danger is the principal argument state officials use to justify their efforts to remove the homeless from the parks. Troopers say they don’t know what else can be done, particularly if LeRoi doesn’t violate laws other than trespassing. Rafferty, who often deals with the city’s homeless, says troopers have received only a few complaints about LeRoi. ‘‘He’s a gentleman,’’ Rafferty says. LeRoi has impressed others in the neighborhood. One man recently brought him a bottle of laundry detergent, though he says he doesn’t really need it. (He usually trashes his old clothes for new ones he picks up at local charities.) Another neighbor slid an envelope with $30 beneath his tarp, which he used to buy toothpicks to clean his yellow teeth, Lysol to kill mold in the tent, a flashlight, and a headset to listen to news on his radio. ‘‘I’m down to $16, but that’s the most I’ve had for a long time,’’ he says. He also receives help from the outreach workers who ride the Pine Street Inn’s big white van, which roams the streets at night, regularly bring him sandwiches, blankets, and sometimes, new tarps. The oddity of such an obvious encampment — the homeless usually prefer less visibility, usually hiding their shanties beneath bridges or in the woods — has created its own camouflage. 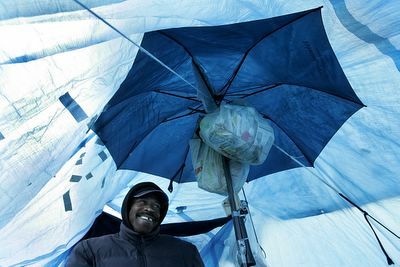 Jan Scullin, 64, who lives in the Back Bay and walks past the tent nearly every morning, hasn’t noticed anything strange about the big blue bulge, or LeRoi’s Roadmaster mountain bike, which he locks to the tent. Other neighbors want LeRoi out. LeRoi insists he wouldn’t be happier anywhere else, even in the dead of winter, even though he’s reduced to urinating in a container. Shelters are for the ‘‘delinquent,’’ he says. The oldest of 13 children, LeRoi grew up in Dorchester, graduated Charlestown High School, served in an engineering company in Vietnam, and went on to work as a licensed electrician, he says. He became homeless in 1990 as the result of major ‘‘family problems,’’ he says and records confirm. He has avoided his relatives since, even changing his name, he says, so they can’t find him. In a recent interview inside his tent, he sits next to the camouflage slicker he uses as a pillow and vents. He shows off his newly acquired toothpicks, which he keeps in a metal Altoids box, and says he has a message for his neighbors. As for the future, he plans to reinforce his tent and convert it into something akin to a gazebo.